All you have to do is head onto Facebook, Instagram, Twitter or Pinterest and tell us what you and your tagged buddy would do with two brand new drones. Use the hashtag #DontDroneAlone and make it good. We will pick our favorite response and that person – and their tagged friend – will win a Syma X5C Explorers 2.4G Remote Control Quadcopter plus 5 Hoo-rags of choice! Winners will be announced on 4/15. You can enter once on every social media platform – that means you can enter up to 4 times. You must be following us for your entry to be valid. 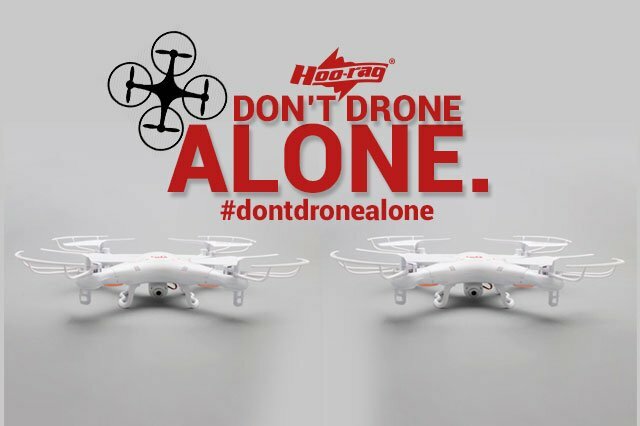 The #DontDroneAlone contest is sponsored by Hoo-rag (here in after referenced as “Sponsor”). This contest is governed by these Official Rules. By participating in the contest each entrant agrees to abide by these rules including all eligibility requirements. Entrants agree that they understand the results of the contest are determined by Sponsor and that the determination by the Sponsor or its agents is final in all respects. The contest is subject to all federal, state and local laws and regulations and is void where prohibited by law. This promotion is in no way sponsored, endorsed by, administered by or associated with Facebook. Any questions, comments or complaints regarding the promotion will be directed to the Sponsor, not Facebook. The Contest is open to legal residents of the United States, who are eighteen (18) years of age or older at the time of entry, have internet access and a valid e-mail account prior to the beginning of the Sweepstakes Period. Sponsor has the right to verify the eligibility of each entrant. The Sweepstakes begins at April 8, 2015 11 a.m. EST and ends at April 15, 2015, 12 p.m. EST. (“Sweepstakes Period”). All entries or submissions must be received on or before the time stated during that submission period. Sponsor reserves the right to extend or shorten the contest at their sole discretion. All you have to do is head onto Facebook, Instagram, Twitter or Pinterest and tell us what you and your tagged buddy would do with two brand new drones. Use the hashtag #DontDroneAlone and make it good. We will pick our favorite response and that person – and their tagged friend – will win a Syma X5C Explorers 2.4G Remote Control Quadcopter plus 5 Hoo-rags of choice! You can enter once on every social media platform – that means you can enter up to 4 times. You must be following us for your entry to be valid. NO PURCHASE NECESSARY. All eligible entries received during the Submission Period will gathered into a database at the end of the Submission Period. A winner will be chosen based on Hoo-rag employee votes. The winners will be announced on April 15, 2015 on or about 5 p.m. EST. Announcement and instructions for prize redemption will be sent to the e-mail address supplied on the potential prize winner’s entry form. Each entrant is responsible for monitoring his/her e-mail account for prize notification and receipt or other communications related to this sweepstakes. If a potential prize winner cannot be reached by Administrator (or Sponsor) within fifteen (15) days using the contact information provided at the time of entry, or if the prize is returned as undeliverable, that potential prize winner shall forfeit the prize. If a potential winner fails to comply with these official rules that potential winner will be disqualified. Prizes may not be awarded if an insufficient number of eligible entries are received. Grand Prize: One Syma X5C Explorers Quadcopter Drone 2.4G (valued at $84.99). Five Hoo-rags of choice (valued at or about $84.75). Any questions regarding this Sweepstakes should be directed to social@hoorag.com. Next post: FREE Floaty Keychain with Every Order and MORE!